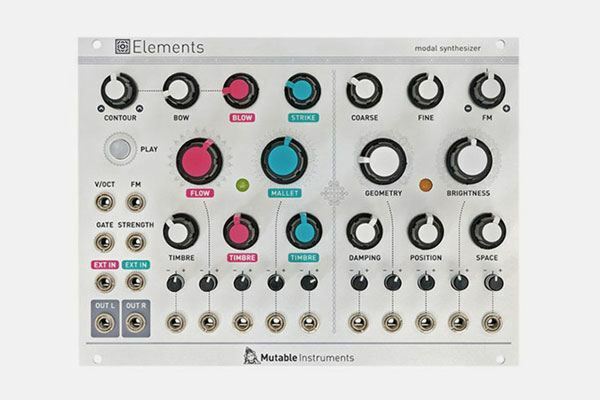 Elements combines an exciter synthesis section generating raw, noisy sounds characteristic of bowing (filtered friction noise), blowing (pitch-controlled granular noise), or striking (stick, mallet, hammer or brush sample playback… or bursts of synthetic impulsions). These sources, or external audio signals, are processed by a modal filter bank – an ensemble of 64 tuned band-pass filters simulating the response of various resonant structures (plates, strings, tubes…) with adjustable brightness and damping. A stereo ambience reverberator adds depth and presence to the sound. It's a preorder item! It will be shipped in the next few weeks. We'll sent you an email with delivery details after order has been completed.